Our lab’s research involves the study of small signaling molecules that cells use to detect extracellular stimuli and to coordinate intra- and intercellular responses. To compensate for their lack of mobility, plant cells rely heavily on chemical cues to interact with their surroundings—one reason why plants are so rich in pharmaceuticals and provide attractive models for studying chemically mediated cell signaling. We use highly sensitive and selective mass-spectrometry-based methodologies to capture and to monitor plants’ chemical messengers, which often exist in trace amounts. Using powerful analytical tools combined with the rich genetic and genomic resources available for the model plant Arabidopsis has allowed us to identify new players in defense signaling cascades within a plant’s immune response against insects and fungal pathogens. Recently, our focus has been to describe mechanisms that control optimal levels of plant hormone jasmonates (JAs). JAs are a group of oxylipins produced by the oxidative metabolism of polyunsaturated fatty acids, analogous to eicosanoids in animals. Similar to eicosanoids, JAs play an important role in mechanical stress-induced responses and plant immunity. Thus, knowledge obtained from this research has implications for use in applied agronomy as well as for the advancement of foundational science in the area of cross-kingdom, conserved chemical cell signaling. In addition, because JAs have been reported to have anti-cancerous effects on certain tumor cells and are master regulators of secondary metabolites in plants, many of which are antioxidants beneficial to humans, the study of JAs will contribute to overall human health. Toyota M, Spencer D, Sawai-Toyota S, Wang J, Zhang T, Koo AJ, Howe GA, and Gilroy S. (2018) Glutamate triggers long-distance, calcium-based plant defense signaling. Science 361:112-115. Howe GA, Major IT, and Koo AJ. (2018) Modularity in Jasmonate Signaling for Multistress Resilience. Annu. Rev. Plant Biol. 69. 387-415. Yurchenko O, Kimberlin A, Mehling M, Koo AJ, Chapman KD, Mullen RT, and Dyer JM. (2018) Response of high leaf-oil Arabidopsis thaliana plant lines to biotic or abiotic stress. Plant Signal Behav. 13(5):e1464361, doi:10.1080/15592324.2018.1464361. Tripathi D, Zhang T, Koo AJ, Stacey G, and Kiwamu Tanaka. (2018) Extracellular ATP acts on jasmonate signaling to reinforce plant defense. Plant Physiol. 176: 511-523. Koo AJ. (2018) Metabolism of the Plant Hormone Jasmonate: A Sentinel for Tissue Damage and Master Regulator of Stress Response. Phytochemistry Reviews. 17: 51-80. Poudel AN, Zhang T, Kwasniewski M, Nakabayashi R, Saito K, Koo AJ. (2016) Mutations in jasmonoyl-L-isoleucine-12-hydroxylases suppress multiple JA-dependent wound response in Arabidopsis thaliana. Biochem Biophys Acta. 1861:1396-408. Schneider A, Aghamirzaie D, Elmarakeby H, Poudel A, Koo AJ, Heath L, Grene R, Collakova E. (2015) Potential targets of VIVIPAROUS1/ABI3-LIKE1 (VAL1) repression in developing Arabidopsis thaliana embryos. Plant J. 85(2):305-19. Nguyen PD, Pike S, Wang J, Poudel AN, Heinz R, Schultz JC, Koo AJ, Mitchum MG, Appel HM, Gassmann W. (2016) The Arabidopsis immune regulator SRFR1 dampens defenses against herbivory by Spodoptera exigua and parasitism by Heterodera schachtii. Mol Plant Pathol. 17:588-600. Smith JM, Leslie ME, Robinson SJ, Korasick DA, Zhang T, Backues SK, Cornish PV, Koo AJ, Bednarek SY, Heese A. (2014) Loss of Arabidopsis thaliana Dynamin-Related Protein 2B Reveals Separation of Innate Immune Signaling Pathways. PLOS Pathogens 10:e1004578. eCollection. Koo AJ, Thireault C, Zemelis S, Poudel AN, Zhang T, Kitaoka N, Brandizzi F, Matsuura H, Howe GA (2014) Endoplasmic Reticulum-Associated Inactivation of the Hormone Jasmonoyl-L-Isoleucine by Multiple Members of the Cytochrome P450 94 Family in Arabidopsis. J Biol Chem 289:29728-38. 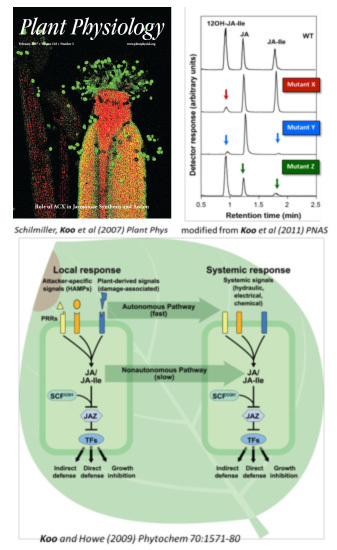 Attaran E, Major IT, Cruz JA, Rosa BA, Koo AJ, Chen J, Kramer DM, He SY, Howe GA (2014) Temporal dynamics of Growth and Photosynthesis Suppression in Response to Jasmonate Signaling. Plant Physiol 165:1302-1314. Bhosale R, Jewell JB, Hollunder J, Koo AJ, Vuylsteke M, Michoel T, Hilson P, Goossens A, Howe GA, Browse J, Maere S (2013) Predicting Gene Function from Uncontrolled Expression Variation among Individual Wild-Type Arabidopsis Plants. Plant Cell 25: 2865-2877. Herde M, Koo AJ, Howe GA (2013) Elicitation of jasmonate-mediated defense responses by mechanical wounding and insect herbivory. Methods Mol Biol 1011:51-61. Sanjaya, Miller R, Durrett TP, Kosma DK, Lydic TA, Muthan B, Koo AJ, Bukhman YV, Reid GE, Howe GA, Ohlrogge J, Benning C (2013) Altered Lipid Composition and Enhanced Nutritional Value of Arabidopsis Leaves following Introduction of an Algal Diacylglycerol Acyltransferase 2. Plant Cell [Epub ahead of print] PubMed PMID: 23417035. Koo AJ, Howe GA (2012) Catabolism and deactivation of the lipid-derived hormone jasmonoyl-isoleucine. Front. Plant Sci. 3:19. Koo AJ, Cooke TF, Howe GA (2011) Cytochrome P450 CYP94B3 mediates catabolism and inactivation of the plant hormone jasmonoyl-L-isoleucine. Proc Natl Acad Sci U S A 108:9298-303. Koo AJ, Howe GA (2009) The wound hormone jasmonates. Phytochemistry 70: 1571-1580. Koo AJ, Gao X, Jones AD, Howe GA (2009) A rapid wound signal activates systemic synthesis of bioactive jasmonates in Arabidopsis. Plant J 59: 974-986. Katsir L, Chung HS, Koo AJ, Howe GA (2008) Jasmonate signaling: a conserved mechanism of hormone sensing. Curr Opin Plant Biol 11: 428-435. Chung HS, Koo AJ, Gao X, Jayanty S, Jones AD, Howe GA (2008) Regulation and function of Arabidopsis JAZ genes in response to wounding and herbivory. Plant Physiol 146: 952-964. Li Y, Beisson F, Koo AJ, Molina I, Pollard M, Ohlrogge J (2007) Identification of acyltransferases required for cutin biosynthesis and production of cutin with suberin-like monomers. Proc Natl Acad Sci U S A 104: 18339-18344. Schilmiller A, Koo AJ, Howe GA (2007) Functional diversification of acyl-CoA oxidases in jasmonic acid biosynthesis and action. Plant Physiol 143: 812-824. 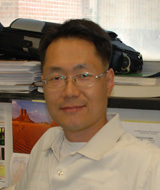 Koo AJ, Howe GA (2007) Role of peroxisomal b-oxidation in the production of plant signaling compounds. Plant Signaling & Behavior 2: 20-22. Koo AJ, Chung HS, Kobayashi Y, Howe GA (2006) Identification of a peroxisomal acyl-activating enzyme involved in the biosynthesis of jasmonic acid in Arabidopsis. J Biol Chem 281: 33511-33520. Koo AJ, Fulda M, Browse J, Ohlrogge JB (2005) Identification of a plastid acyl-acyl carrier protein synthetase in Arabidopsis and its role in the activation and elongation of exogenous fatty acids. Plant J 44: 620-632. Koo AJ, Ohlrogge JB, Pollard M. (2004) On the export of fatty acids from the chloroplast. J Biol Chem 279: 16101-16110. Beisson F, Koo AJ, Ruuska S, Schwender J, Pollard M, Thelen JJ, Paddock T, Salas JJ, Savage L, Milcamps A, Mhaske VB, Cho Y, Ohlrogge JB. (2003) Arabidopsis genes involved in acyl lipid metabolism. A 2003 census of the candidates, a study of the distribution of expressed sequence tags in organs, and a web-based database. Plant Physiol 132: 681-697. Koo AJ, Ohlrogge JB. (2002) The predicted candidates of Arabidopsis plastid inner envelope membrane proteins and their expression profiles. Plant Physiol 130: 823-836.